Feather Industries was established in 1946 as a division of Canada Packers, a large food distributor. In 1984 Feather Industries was sold to a private ownership group and continues to be a privately owned and Canadian operated manufacturing company, specializing in the processing and sale of duck and goose down and feathers. We supply a wide range of industries including but not limited to home textiles/bedding, fashion and functional outerwear, outdoor recreation, and upholstery. 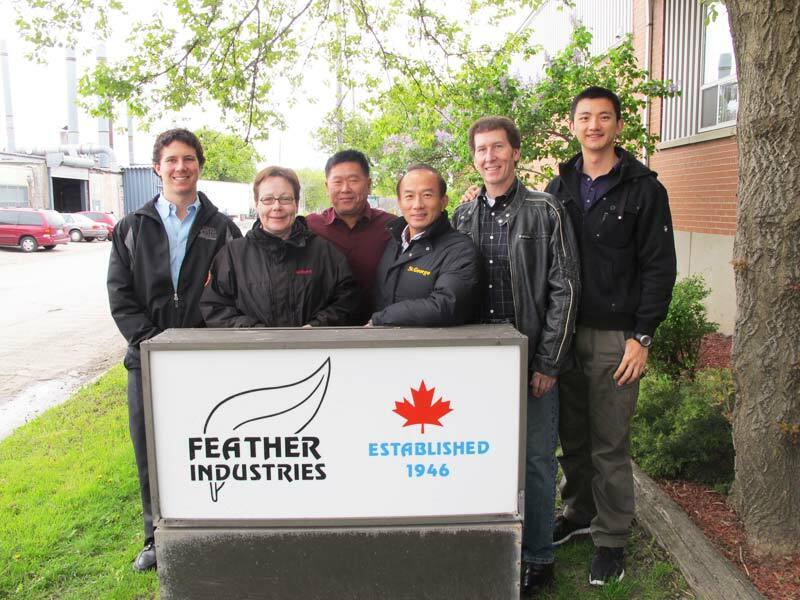 Feather Industries’ facility is located in Toronto, Canada and includes office and administration, processing and manufacturing, warehouse, and an on-site quality testing laboratory. As the name of the company implies, the main product is feathers. We buy directly from duck and goose farms in Canada, Europe, and Asia – wherever duck and geese are raised for their meat as all feathers and down are a by-product of the poultry industry. The selection, grading, and processing is all done entirely at our facility in Toronto. Additionally, all down and feather bought, processed and shipped is tested in our on-site laboratory. We take great care in our quality control and testing process so that the product we provide meets or exceeds Canadian and international quality standards and regulations. Since its inception, Feather Industries has maintained a policy of honesty, integrity and responsible growth, always focusing on the importance of selling a high-quality, competitively priced product. We pride ourselves on our strong business ethics, and we hold our company, associates and products to the highest standard. Bryan Pryde, the President, CEO and major shareholder of Feather Industries, is also a board member and Vice President of the Down Association of Canada (Downmark), of which our company is a founding member. Downmark is a non-profit association with a mandate to educate the public about down and feather products. Downmark also monitors the marketplace, to ensure down and feather products and advertising adhere to Federal and Provincial government regulations (www.downmark.com). Feather Industries also committed to maintaining a strong sense of corporate social responsibility. We have researched and developed methods to make our processing more efficient and eco-friendly. For example, we recently implemented a water recapture and recycle system, which saves millions of litres of water each year. Furthermore, the detergents used in our processing to extract grease and dirt are biodegradable, as are all of the by-products produced in the processing of our down and feathers. Still, we will continue to look for more ways and better methods to reduce waste in all aspects of our process. Feather Industries is proud to be a strong advocate for the fair and humane treatment of animals. All of our feather and down products are harvested following government regulations which means no live plucking. As mentioned, all our feathers and down procured are a by-product of the poultry industry, however, no feathers and down are ever procured from farms that raise their waterfowl for fois gras production. Each year our staff personally visit our approved supply vendors (farms) to ensure our business partners follow an agreed upon ethical code of conduct.